Getting new customer leads is exciting, but that enthusiasm can quickly wither when you don’t know how to best convert leads into new clients. Online leads do not automatically translate into sales. Per Marketo, only 25% of leads ready to buy from you. 79% will never convert if they aren’t nurtured after the fact. 1/4 of leads are qualified, meaning approximately 75% aren’t your ideal customer. Now, don’t let these numbers frighten you. In addition to this, you must understand the psychology behind the lack of leads turning into sales. Trust: People don’t trust themselves, so how do you expect them to trust you immediately upon connecting with your business for the first time? Traffic to your website may not always translate into sales if your leads are reluctant to buy from you. The absence of trust can stem from a lack of proof showing you do what you claim, lack of contact information, a poorly designed website, or non-targeted content. Authority: If you don’t establish yourself as the authority in your field, through quality content, you will find it quite hard to gain customers, because they may see you as untrustworthy. Money: If your price doesn’t match the perceived value of your products or services, you are likely to miss out on sales. Time: If the customers feel that the time is not right, they are likely not to purchase. Building a reliable brand will ultimately make it easier for you to market your product or services. One of the best and easiest ways to build trust is through social proof, specifically reviews, and testimonials from your current or previous clients. Social proof will not only confirm that you’re talking the talk, but that you’re walking the walk. Let your current customers sing your praises by encouraging them to write a review or testimonial through email, on Yelp, Facebook, or any other relevant review site. For those “special” reviews, showcase them on your website. Do not worry about getting one or two negative reviews. This might work to your advantage, in that, they persuade leads to believe that your reviews are reputable. If people see that others are buying your products and enjoying them, they can be persuaded to follow suit. Helping your prospects means providing answers to their problems through content. This content marketing strategy revolves around blog posts as well as free offers. Invest your time in writing well-researched and helpful blog content and eBooks. If your leads find that you are knowledgeable in your industry and in the various products that you’re selling, then they will believe in your ability to provide quality products. You can hire marketing agencies to write blog posts for you. Or, you can learn simple shortcuts and time saving templates to train you and/or your marketing assistant to turn your knowledge into written blog articles for your business website. One of the most crucial strategies for converting leads into sales is to have a qualification process. Lead qualification is the evaluation of the ability of a lead to purchase from you. The qualification process involves gathering the necessary information about your leads to move them through the sales process. There are three types of leads: Information Qualified Leads (IQL), Marketing Qualified Lead (MQL), Sales Qualified Lead (SQL). How each is determined varies from business to business. Once your qualification metrics are defined, only then will you be able to take appropriate action that will convert your leads into sales. Using a sales qualification process prevents you from coming on too strong and putting off potential clients. It also helps your sales team save valuable time and instead focus it on customers who are ready to buy. For those leads who have not been identified as “ready to buy” or an SQL, you can nurture them through your sales funnel using email marketing solutions. Email nurturing is one of the greatest tools that you can use to convert leads into sales. It’s all about leveraging marketing automation to follow up and remain in contact with any leads that come through your sales funnel. If you follow up with leads within 5 minutes, you are 9 times more likely to get a sale. Strategically sending your clients or customer regular emails will drill information about your business and your services or products into their minds. The more they hear from you, the more they are likely to buy. You want to send targeted emails, to targeted email lists, based on where they are in your sales funnel and how they interact with your emails. These emails can be anything from newsletters to content offers. The purpose of this strategy is to guarantee the right lead is receiving the right email at the right time. Today, even though most marketing efforts are online, customers still need to feel that personal touch. 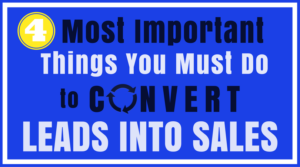 By incorporating these few lead conversion ideas into your business strategy will help to ensure that you not only have thousands of people stopping by your website, but you will have them laying down their money! QUESTION: What is your favorite strategy that’s been working for you in your business when it comes to converting leads into sales? Share your comments and questions below.